Let consider two Visual Studio Online (TFS running as a service on Microsoft Azure). Who would have thought that a difference would exist between 2 VSO accounts ?? Something unusual occurred to me when I wanted to add new users onto my new VSO account. On the left, VSO it requires a connection with Microsoft Azure Active Directory. On the right, it is not linked to AAD (look carefully on the bottom of the screen shot). 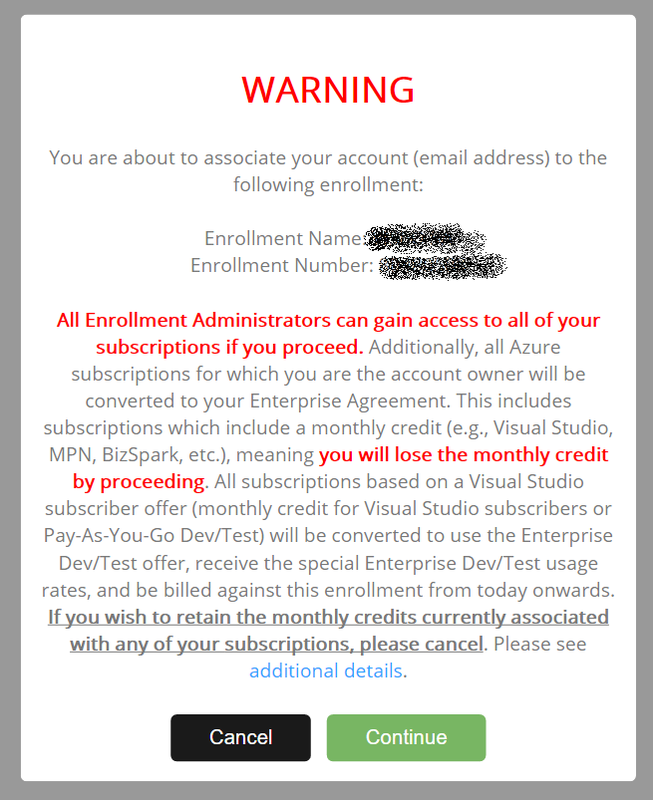 First, when you want to link your VSO to a Microsoft Azure Account, it will detect the, say “thavo001.VisualStudio.com” belongs to the AAD “Objet Direct”. where as the second case is not (“Not connected to a directory”). Whereas, when “not connected to a directory”, adding a new user is instantaneous. This differences comes from a historical privilege that some of us had to be a VSO “Early Adopter” where AAD not not yet connected. Now a more secure way is to use your Microsoft Azure Account to instanciate a VSO account, where automatically an AAD would be associated. This is a report of the first Global Azure Bootcamp in Lyon, that welcomed over 120 people. It is an international event involving more than 138 cities in the world in 56 countries. The association MUG -Lyon was chosen to organize the Lyon edition! And I was the lucky person who has organized all this with many partnership. As far as I am concerned, not only was I busy organizing the event, I also presented 2 sessions as Microsoft vTSP (“virtual Technology Specialist”). I designed three tracks in // to address the needs avec everyone, and to ensure all can fit in one day !! Ever wonder what are the advantages of an Enterprise Agreement (EA), as opposed to “Pay-as-you-go” and 6/12-Month Plan ? apart from a costing standpoint with discounted prices, since you are buying more. This post presents some of the advantages, and how to configure the account. Firstly, you will be able to create as many subscriptions as you want, so that it matches both Cost Center and enforces true separation between Development accounts and Production one (for instance). This done by the flexible following model based on 3 roles (Enterprise Administrator, Account Owner and Service Administrator). An easy to understand tutorial in few steps is made available (less steps if you are “only” Account Owner) in your EA portal (https://ea.windowsazure.com). When you first login, you might receive this scary message. 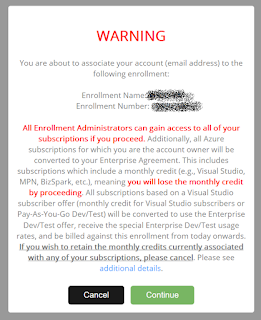 Check that the Microsoft Account you are using does not depend on other Azure Subscriptions (such as MSDN, etc...). Now, let’s walk through the registration of a new subscription. DONE. Here is your new subscription. WARNING, a best practice consists in renaming the default “Enterprise” subscription name into a meaningful name that suits your business. Else, you will end-up having many subscription without know which one does what. To rename, click on “Enterprise”, i.e. the default subscription name. For companies using Microsoft Azure, when applicable under conditions of being a very closed partner with Microsoft, you could activate benefits when you declare your “DPOR” Microsoft partner, Digital Partner of Reference. 6. Select “Partner information”, then fill in the number 3398971. When you click “Check ID” Azure finds the corresponding DPOR. It will send an email to your DPOR (provided you have a subscription that has an explicit naming convention).